Meraloma Bike Club - Meraloma Bike Club Season 4 All Riders, All Levels Welcome! Welcome to Season Five! Meraloma Bike is an inclusive road cycling club that caters to riders of all levels. It's the official cycling division of the Meraloma Athletic Club located in the heart of Kitsilano on the north side of beautiful Connaught Park. Saturday rides starting April 6th - 9 a.m.
Wednesday rides starting May 1st - 6:30 p.m. The Meraloma Bike Club is back for Season five and is actively recruiting new members. Membership fee for new members is $195 and includes our club jersey. Membership fee for returning members is $95 (no jersey included). Meraloma Bike is also actively seeking sponsors for our club, and there are many options to choose as we go forward. We are keen on sponsors that will continue the tradition of being actively involved with our club as well as our wider community. On Wednesday nights we train. On Saturdays we ride. We cycle everywhere across the GVA: Steveston Village, Horseshoe Bay, Deep Cove, Mount Seymour and other places in between, and we always stop for coffee and snacks. It's a big part of what we love to do. We believe nothing beats exercise without mixing it up with camaraderie, humour and fun. Are you looking for a friendly cycling club of all abilities? in its various divisions, the cycling section is entering its fifth season catering to riders of all levels and ages. 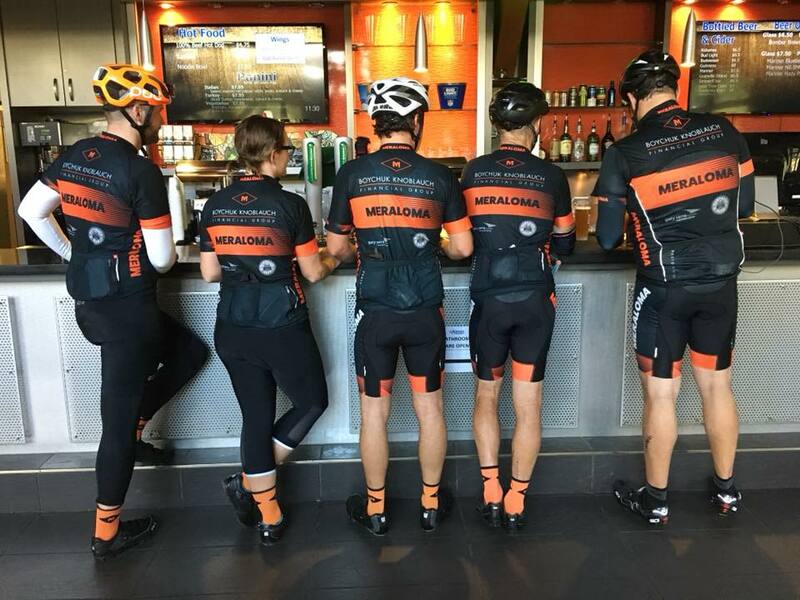 Meraloma Bike Club Members enjoy discounts and benefits from Speed Theory, West 4th Physio, Red Truck Beer, Unified4Adventure, Dunbar Cycles and The Regal Beagle. All registered members will also receive a Meraloma Club Membership Card. This entitles the bearer to a very good discount when you buy a fitness pass at Kits CC, among other benefits. It even qualifies the member to jump the lineup at Bimini’s! Does road cycling up and down hills and mountain roads get your juices flowing? Join us this season and embark on cycling adventures that will take you all over the Lower Mainland under the supervision of our trainers and knowledgeable ride leaders. Club Members can access our club house facilities anytime with full use of the facilities including showers, storage, clinics, licensed bar and food services. After an awesome ride, it's great to get together at the clubhouse.